By the Power of Grayskull, the original He-Man series finally arrives on DVD that unleashed a whole wealth of happy childhood memories from this 80's "retro" cartoon series. This was the time of the Go-Bots and the Transformers plus a wide myriad of other memorable cartoons that also created some great spinoff series such as She-Ra Princess of Power. For those of this era, He-Man revolved around Prince Adam, a humble and clumsy Prince who was almost a Superman/Clark Kent archetype. There was even a comic that had Superman vs He-Man that of course ended as them being friends. Unfortunately in Prince Adam's world, that of Eternia, an endless war has been fought between the forces of Castle Grayskull and the villainous Skeletor. The star of the series was the magical sword of Grayskull that when Prince Adam spoke the words "By the Power of Grayskull", he was magically transformed into the hero He-Man. This power would also transform his cowardly tiger into the ferocious Battlecat and together they would venture into battle. The companions of Prince Adam or He-Man included Man-at-Arms, his daughter Teela and the beautiful Sorceress plus the imp Orko who provided comedy relief. Episode after episode, He-Man would always be defeating the mad plans of Skeletor and his lackeys that included Evil Lyn, Trapjaw, Beast-Man and Mer-Man to name a few. Each of Skeletor's motley crew had various special powers and they would constantly be attempting to take over the world. The series featured everything from action, adventure and classic sword and sorcery characters but ironically, no one ever got killed, even with all these sharp weapons flying around. The series proved so popular that it produced a variety of He-Man action figures and even a great spinoff series called She-Ra Princess of Power who was He-man's long lost sister and was a far superior series in terms of writing and animation. 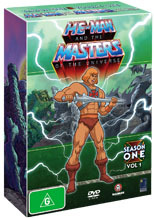 Needless to say, He-Man and the Masters of the Universe Season 1 is a very satisfying DVD that I could recommend to all fans of the character or if you're an adult and wish to let your kids in on some of the television shows that you watched. Sure, the animation is bad when compared to today, however, it's still an entertaining experience that children will adore. The first of four volumes collecting all 130 episodes.